The purpose of prospecting is to develop prospective clients for your real estate business. The prospecting method, even in today’s world where people text more than answer the phone, still has merit and success attached. The figure shows a hierarchy of pyramid of sales and communication. 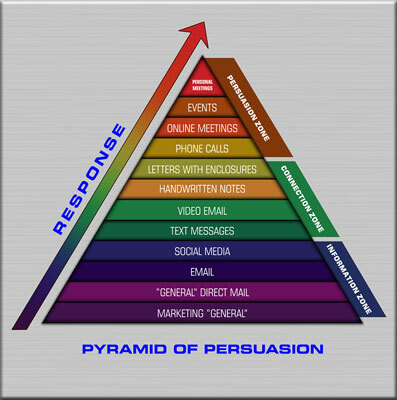 This pyramid shows the power of persuasion is increased, as well as the impact, the higher you move on the pyramid. As the figure shows, informational marketing strategies are the lowest level of communication and influence. The direct mail and advertising we do, for example, through billboards or other advertising mediums, require a lot of impressions because of the limited persuasion they contain. Incorporating some type of social proof or validation can increase the effectiveness, but they are at the bottom of the information zone. When you move up into email, social media, text communication, and video email, you are still in the information zone. You are transferring information — creating a connection but not selling. You will achieve a higher response rate to a Millennial prospect if you send a text. Millennials use texting to communicate. Response rate is part of selling. It’s an important part of selling . . . but it’s not the only part of selling. You have to persuade, handle concerns, and change thinking in order to make a sale. There is no evidence, in fact, that you can do that better via text than via phone or face-to-face conversation. All evidence is that the conversion rates are better in face-to-face and phone-to-phone voice communication than in electronic communication. All the electronic options are part of an effective sales strategy. You need to build effective social media messaging. That messaging needs to create engagement and a relationship. The text messaging needs to be short and effective and have a solid call to action (CTA). The missing element in most text communication is the CTA. All electronic communication is in the information zone of communication. Because of the image and public perception of salespeople, especially real estate salespeople, the more you can break through that consumer mind-set of agents that know little, earn a lot, don’t do much, and are out for their self-interest, the more effective you will be in establishing trust and credibility. You need to smash that mental image of a salesperson that they have. This is especially true for online leads, whether that is pay-per-click, organic, Craigslist, Facebook ads, or other forms.